It was thirty five years ago today (July 17, 1980) that Ronald Reagan accepted the nomination of his party for the Presidency of the United States of America. With the passage of time it is easy to forget just how unlikely and revolutionary the ascendancy of Reagan was. 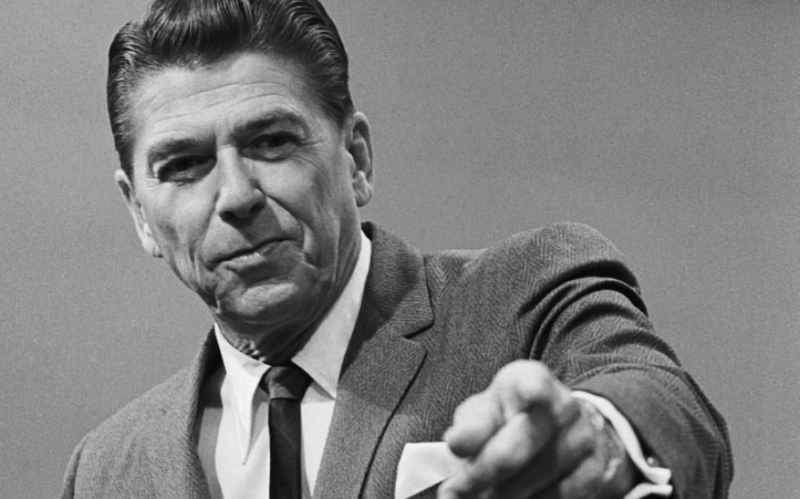 While most Americans were themselves center-right politically and socially, no leader had ever been nationally elected espousing such unfiltered conservatism as Reagan did. However Ronald Reagan, always the optimist-and nearly always smiling-was the perfect spokesman to mainstream the modern Conservative movement (what came to be known as the Reagan Revolution). Looking back at Reagan the politician there is a valuable lesson for today’s Catholic Traditionalists. Most notably it is this: optimism is inherently attractive to people. A positive message, one that displays conviction and expresses solutions, is appealing to people. Reagan consistently demonstrated a faith in the American experiment, as well as a hope in the future, even when he was most critical of contemporary problems. It was this unwavering faith and boundless optimism that converted so many to Reagan’s cause. For those of us who write or speak of the need to restore the sacred to the Church, who seek to convince others of the need to recover the traditional (particularly within the liturgy), Reagan’s brand of optimism is much needed. Thankfully, and like Reagan, we have truth on our side. Those of us who regularly assist at the Traditional Latin Mass, and who have found the grace and beauty which abounds in the traditional liturgy of the Roman Rite, must share this joy. Those who have found beautiful and reverent Novus Ordo masses offered by good and holy priests must not hide this treasure from others. Understandably, many who have rediscovered the truth, beauty, and goodness of tradition often rush to share it with others. This is a good thing no doubt. However, in our enthusiasm we at times can lose patience with others who have not yet found the immeasurable treasures of our Catholic faith. At times our resulting impatience, frustration and even cynicism can undermine all that we are trying to accomplish. Returning to Reagan, let’s remember that the “Great Communicator” (as he was known) never demonized his opponents. The Reagan Revolution was won largely because political converts, most notably “Reagan Democrats”, recognized the authenticity in his message and the sincerity of the man. The effectiveness of Reagan’s message greatly benefited from his infectious optimism. Thirty-five years after his nomination for the Presidency, let us remember the example Reagan provided. We have tradition on our side. We have truth on our side. We have beauty on our side. We cannot lose in our defense of the faith and in our restoration of the sacred, unless we get in the way of the message. Let us be a people of faith, filled with hope and optimism, always trusting in Our Lord. Posted on July 17, 2015, in life, liturgy and tagged latin mass, optimism, restore the sacred, Ronald Reagan, traditional catholicism, traditionalists. Bookmark the permalink. 2 Comments. Just read a “Ronald Reagan” bumper sticker today.something like. ..”Every person who is for abortion has been born…” Love that president! Remembering that faith moves mountains and that charity softens hearts, let us share the treasures of reverence and sacred music in the Mass with those who seem resistant.